I was surprised to see in the Washington Post Magazine this morning a cover story and photo of a sculptor and a scale-model of his Motherhood Memorial. Never heard of it? That’s because it was never built. The story behind the memorial is one of scandal, betrayal and blackmail – none of which are befitting mothers on today, Mother’s Day. The idea itself was monumental - the mother of all memorials. A memorial suitable to acknowledge everything mothers have done for the world. "The world has memorialized fighters, thinkers, monarchs and prophets, sea kings and generals," said Mrs. Clarence Crittenden Calhoun who was the driving force behind the memorial. "But as yet no monument to the mother genius has been raised in imperishable stone, beautified by art and sculpture, to proclaim the debt each mortal owes to the woman who risked her own life to give life." 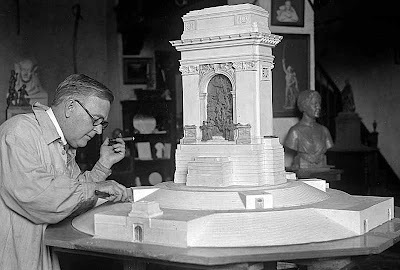 The memorial’s first design, by William Clark Noble, was a massive, hulking edifice 297 feet tall white marble arch with many bronze figures and marble steps as long as a football field. Planned to be built in Washington, D.C., It would have been 3 times taller than the Lincoln Memorial. Changes to the design and scandal lead to the memorial’s demise. Many architectural critics, however, are glad it was never built. Too many cooks in the kitchen and no head chef in this case. What do you think of its design?